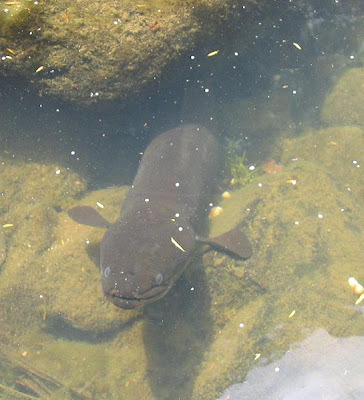 The Longfin eel lives in pools of rivers in small forests. It is brown, long and has gills. It also has two fins for swimming and a back one for direction. It has two eyes on the side of its head so it can see left and right. The longfin eel has two feelers on its head to feel what is in its way. The way a longfin eel breathes is that it swallows water and pumps it over its gills and pumps it back out of its body. The longfin eel eats banded Kokopu and Redfin bullies. A longfin eels life cycle: it starts as an egg in Tonga, it turns into a leave shape larva which floats back to New Zealand. It turns into a glass eel then to an Elver, and finally an adult. A Longfin eel can live up to 80 years but passes away when it has given birth to her eggs. Watch out for my full report in a couple of weeks. Wow Daniel! What a fantastic start to your report! You really know your stuff on the long finned. Maybe you could come and teach this to my class! Keep it the great work! !